January evenings start with Mars hanging low over the western horizon at sunset. It will seem to stay in the same place at the same time evening after evening while the stars slide downward. For people in the northern hemisphere, the sky will be a little brighter each night as the sun sets a little later. 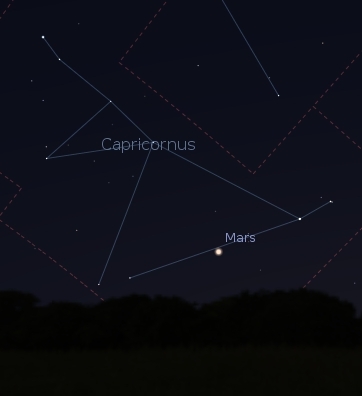 You’ll see the red planet below Capricornus. Mars gets a visit from the moon on the 12th. The Great Square of Pegasus and Pisces close to the meridian around sunset at the start of the month. 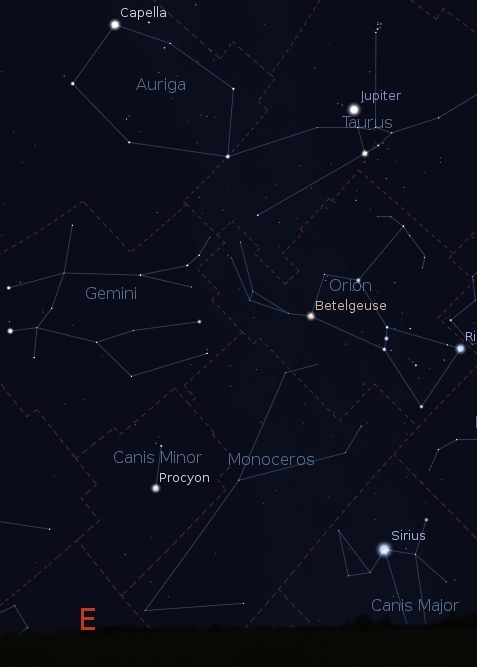 Orion is rising with Taurus above it. Jupiter stays near the Hyades V in Taurus all month. The moon passes Jupiter on the 22nd. Leo rises in late evening. Virgo and Boötes follow it. Saturn is in Libra and rises after midnight. The moon will be near it on the 6th and 7th. Venus remains low on the eastern horizon before sunrise. The moon will be next to it on the 10th. The best views for this will be at low latitudes. Earth will be its closest to the sun all year on the 2nd. The earth-sun distance doesn’t change much during the planet’s orbit. At 147,000,000 km (91.4 million mi), Earth will be 98% of its average distance from the sun on that day. Mars will be at its closest to the sun on the 24th. Its distance is 207,000,000 kilometers or 128,000,000 miles from the sun. Mercury will be at its farthest from the sun on the 4th. You may be able to see Mercury in the morning during the first week or so of the month. It’s getting closer to the sun, so it will be a challenge. Some people in the Indian Ocean and western Australia will see the moon pass in front of the bright star Spica on the 5th. The moon will pass in front of Jupiter on the 22nd. That occultation will be visible from part of South America and part of the Pacific Ocean. The Quadrantid meteor shower peaks January 3rd and 4th. This is a morning shower for the northern hemisphere. The origin is near the Big Dipper. You may see only the brighter meteors though with a waning gibbous moon in the sky. The moon will cross the equator going south on the 3rd, reach its southernmost point on the 9th, cross the equator again going northward on the 15th, reach its northernmost point on the 23rd, and head south across the equator again on the 30th. Last quarter will be on the 5th, the new moon on the 11th, first quarter on the 18th, and full moon on the 27th.